With the summer holidays drawing to an end, offices and workplaces will start to fill up again and it’s time to start (re)building working relationships. 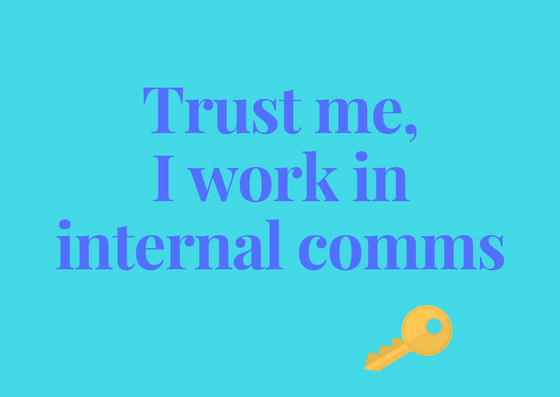 This month’s guest post comes from internal comms expert, Advita Patel, who shares some tips for becoming a trusted adviser. If you’ve ever worked as an Internal Communications professional you will understand how challenging it can be for us to move away from the perception that we are only there to do fancy events, send out stuff and make presentation decks look pretty. Now don’t get me wrong, this can sometimes be the part and parcel of our job and some of us may not have choice in the matter but how we are perceived in an organisation – well that ball is firmly in our court. 1)	Speak the lingo: If you’re going to become a Trusted Adviser to your leadership team then you need to speak their language. This means you need to know the organisation you’re working for inside/out. Everything from business performance, including HR and Finance issues, to health and safety performance. This will require some legwork (especially if you’re new) and you’ll have to build up a relationship with people who are experts in this data – these guys will be your extended team so treat them well. (Side note: This information will also come in extremely useful for your internal comms strategy and plans so you are aligned with the overall objectives of the business and can help demonstrate your ROI). 2)	Knowledge is power: As well as being aware of what’s happening in the business you need to be able to share some external knowledge and be mindful of what’s happening in your industry. Senior leaders want their organisation to be the best it can possibly be, but they also want to be at the top of their field. If you can share some case studies that have worked in previous organisations or ideas that you’ve heard at conferences/seminars it will really help build up your trusted status. One of the main reasons I joined the CIPR Inside committee was to build up my network so I could learn from others. I also take part in seminars, webinars, workshops and try to attend as many networking events as possible – not all related to comms. One of the best workshops I attended was how to read body language, that one day programme has helped me so much in my career (alongside my coaching/mentoring training another programme I highly recommend). 3)	Stay on top of your game: Once you’ve built up your reputation and have gained the Trusted Adviser status – don’t become complacent. It’s really easy to fall into a trap of comfort but you really need to keep your ideas fresh, keep your finger on the pulse and be aware of anything that might be going on in the organisation – so as well as maintaining your relationship with leaders ensure you keep your relationships with front-line colleagues/unions/customers active. The number of people I’ve seen fall at this hurdle is unbelievable, including myself. 4)	Find your advocates: If you’re struggling to gain momentum with some senior key leaders, then look at each one on a case-by-case basis. Find out what their biggest worries are and speak to their deputies/teams. It’s important to understand their stresses and how you can help resolve them. This will help you to slowly start to build your relationship. Once one leader sees the value you’re adding word will spread and you’ll be asked to support others. 5)	Speak out: This is an important one and crucial if you’re going to be respected as a Trusted Adviser – speaking out when things are not going well or if your leader is about to do something that goes completely against your code of ethics is vital. It will be challenging and uncomfortable at first but if you know in your gut that something isn’t right then you need to call it out. It’s a key role that a Trusted Adviser would play. If you allow them to go under a bus or make decisions that are not ethical, not only does it go against everything we stand for as a Communicator, but it won’t be long before you’re dragged under with them. Finally, remember that most senior execs and leaders are normally looking for reliable, knowledgeable and trustworthy people. I’ve been lucky enough to meet some fabulous senior leaders in most of the orgs I’ve worked in and I’m proud to say that some have even become good friends.